If anything underscores our inclination to repeat history, it's our art. Perennially relevant plays like Bertolt Brecht's classic "Mother Courage and Her Children" demonstrate that war is timeless, enduring and perhaps inevitable. The play with music is an unsentimental look at war profiteering, written at the start of World War I and set in Europe during the Thirty Years' War. While the production at La Jolla Playhouse as a whole may not be as cohesive as its visual "dilapidated circus" theme, the anti-war point of "Mother Courage" comes through loud and clear. Brecht, a practitioner of political theater, was perhaps the most influential dramatist of the 20th century and the forerunner of post-modernism. More than any other playwright, he popularized the concept of epic theater, with its "distancing effect," designed to highlight the artificial nature of theater and allow audiences to mull a play's themes objectively and unemotionally. Director Lisa Peterson, in a darkly funny and visually striking production, gets a lot of the Brechtian elements right, especially the presentational style. The strong cast of 12 -- including two musicians and four students in UCSD's MFA program in theater -- speak the stage directions, and mark up the floor and walls of the theater with random phrases, settings, the passage of time and profundities. The layers of chalked words recall both the schoolroom (Brecht is trying to teach us something, after all) and the chaos of war. It's 1624, at the height of the Thirty Years' War, and Anna Fierling (Ivonne Coll), aka Mother Courage, wanders through Europe with her wagon and her three children, following the troops and selling goods to anyone with money. The play follows Mother Courage through 12 years of war in as many scenes, as she readily switches sides between the Protestants and the Catholics -- it's as easy as raising a different flag -- as any good entrepreneur would. The play asks the important question of whether it's possible to be complicit in war without falling victim to its ugly side effects. Substitute Halliburton for Mother Courage and you have a truly contemporary reading. Mother Courage hopes to profit from the war while keeping her three grown children untouched by it. Impossible. Her aggressive son Eilif (Scott Drummond) impetuously joins the war, seduced by the promise of glamour and money. His war-time atrocities, committed during peace time, will ultimately prove his downfall. Swiss Cheese (Ryan Shams) is too pitifully dim-witted to avoid conscription and Kattrin (Hilary Ward, who emotes without speaking a word) is too naive to survive in such a world. In a premiere production in 1941 not staged by Brecht, the character of Mother Courage moved audiences to tears. They saw her as a tragic heroine with an almost noble instinct for survival. Brecht was furious at the results. He rewrote the play to ensure that it would not be interpreted sentimentally, and Peterson has followed that directive. That's not to say that the play is without pathos. 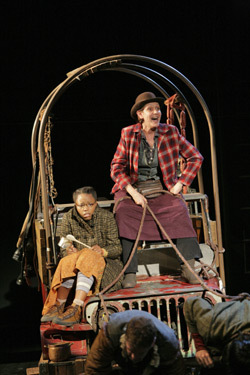 Coll's Mother Courage is a vicious capitalist with world-wise cynicism. She rides onto Rachel Hauck's minimalist set like some vagabond gaucho inebriated on the smell of money, holding the reins of a Jeep jalopy being pulled by her two sons. And though unambiguously exploitive -- see her removing the sellable shoes from her child's lifeless body -- Coll also infuses the character with bouts of humanity. Her Mother Courage is not a character to be wholly hated or admired, but simply not mimicked. Music by composer Gina Leishman adds immensely to the mood and circus theme of the production. Her tunes for snare drum, tuba, accordion and piano are jangly and dissonant, sad, caustic and funny -- perfectly underscoring Brecht's humorously bleak script. One of the best musical moments comes with Katie Barrett's lampoon of a sprawled out, piano-top torch song. Barrett is keenly funny as a whore who later widows herself into money. Patrick Kerr and James Eckhouse are also adeptly gutless and manipulative, respectively, in their roles as the parasitic men who latch on to Mother Courage for survival, protection and possibly love. Everyone, it seems, is profiting or complicit in the war. Brecht makes a strong argument that those who actively do nothing are equally as involved. Brecht saw theater as a powerful force to effect social and political change. He wanted his audiences to take a critical perspective of his works and struggle against complacency and complicity. While the La Jolla Playhouse production may not make such a bold statement to those already singing with the choir, it should have a lot to say to those who are being actively stalked, wheedled and recruited into an unwinnable war fought on specious grounds -- our young adults. The language in David Hare's adaptation should also appeal to the Jon Stewart-Stephen Colbert set. It's simple, straightforward, occasionally off-color and drips with cynicism: "As long as there's corruption, there's hope." "War is like love; it finds a way." Or, "What's courage? Failure of planning, that's all." If ever there was a smart, relevant, engaging production that teenagers should see, this is it. PROGRAM: "Mother Courage and Her Children"
Show times: Tuesdays-Wednesdays at 7:30 p.m., Thursdays-Fridays at 8 p.m., Saturdays at 2 and 8 p.m., Sundays at 2 and 7 p.m.